Opportunity blocks is another fun voluntary activity we do in the guild. The chair person picks a block to make every other month that is alternated with the Friendship Blocks. All members are eligible to participate and can make as many of these blocks as they like. Their name goes into a basket for each block that is made and a drawing is held. The winner takes home all the blocks to make whatever they like with them. Click here to see past opportunity blocks. Use brights colors for the bow. Use black and white prints for background. Use 1-½” squares to snowball the background squares. Sew a snowballed background square to each bow bright color square. Sew the two-square units to each other, placing snowballs diagonally to each other. Congratulations to Merdie would won all these colorful blocks in March. ● Chose a color: one fabric darker, one fabric lighter, prints or solids. ● Use black or black tone on tone for corner squares of the four-patch frame. Sew (2): 1 square of light color to 1 square of dark color. Sew 2-patches into larger square, alternating colors to create center square. Sew (2) white rectangles to opposite sides of the four-patch center square. Sew a black square to each short end of remaining 2 white rectangles. 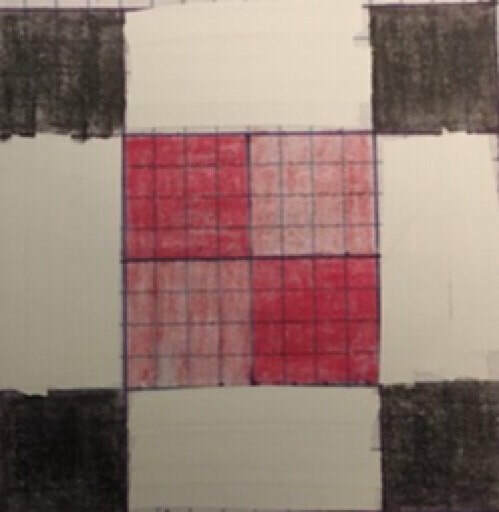 Sew black/white rectangles to opposite sides of center square/white rectangle unit.